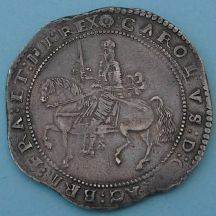 1805 Crown Charles I, Exeter mint, king on horseback, R. oval garnished shield, 1644, mint mark rose. S.3058. Good very fine.